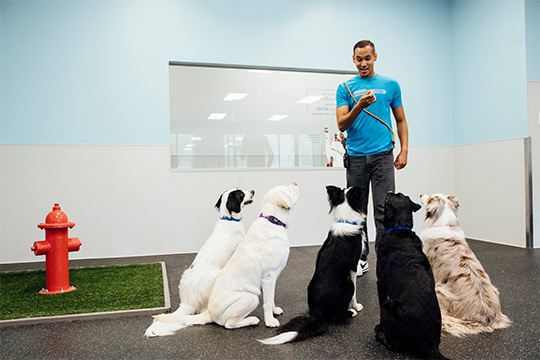 Our approach to dog daycare goes a long way to improving behavior but if you feel your pup could benefit from more training we also offer individualized and group behavior training. Group training classes run weekly over a 6-week window. We’ve built in flexibility for attending to ensure that even the most time-pressed individual can make it for all their sessions. We focus on 8 basic commands/behaviors (Sit, Down, Wait, Stay, Come, Touch, Focus/Watch Me, Loose Leash Walking). We have three levels for each command (Beginner, Intermediate, Advanced). As your dog progresses through each session we’ll evaluate and verify that they are mastering each command. As your dog masters each basic command they move up to the next level. This gives you the flexibility to work with your dog at a beginner level for some commands while working on intermediate or advanced for other commands. Once they master Advanced for a specific command you can then substitute a new command of your choosing that you want to work on in place of the one they have mastered. We’ve built in flexibility to choose any of the dates to attend which makes it easier to manage to your schedule. The only request is please try not to have more than a 10-day gap in attendance since it will impact your dog’s training development and let us know by noon the day of the class if you plan on attending so we can ensure we have enough trainers to work with all the pups. Additionally, you’re given all the commands and sequencing in written form to take home as well. There is also homework in some cases with some commands. Your dog doesn’t have to be spayed/neutered but if female they cannot be in heat. They must be on a leash at all times except when the trainer requests a leash be removed. Please do not bring a retractable leash as this allows your dog to be farther away from you than needed. You need to call to confirm the session you are attending by Noon that day so we can have enough trainers to manage all the dogs in attendance. Purchase a block of 5 sessions for $99 or a block of 10 sessions for $179. Attend any of the following 12 dates (4/9, 4/11, 4/16, 4/18, 4/23, 4/25, 4/30, 5/2, 5/7, 5/9, 5/14, 5/16) until your block of training is exhausted. You can always purchase more sessions if you feel you need additional work during the window. Download the 2019-Spring-Dog-Training-Registration-Form here, fill it out and email it in before 4/8/2019 to enroll in the class. Here’s a look at what one of our pups was able to pull off after training. Mom isn’t happy with his overall stay (moving from sitting to laying) but considering he didn’t know the command at all before classes started and she can do a 360-degree walkaround while he holds isn’t bad at all! Dogs typically learn better with short sessions (e.g. under 15 minutes) and higher frequency (e.g. multiple times a day). While it doesn’t make sense to have a trainer show up at your house 2-4x a day for 10 to 15-minute sessions it does make perfect sense to work on training while they are at daycare or boarding. We can easily take your dog to a training room and work with them on an individualized basis multiple times a day. As with everything we do, there would be a structured plan that we would work with you to create and then provide notes on progress as well as a complete description of the training we’re conducting as well as how to duplicate the training when they get home. Consistency is key for us at Dogtopia of Edmond and we want to make sure whatever rules and expectations you have in place are built into our training structure. Discuss with us what you’re looking to achieve and we’ll build out the full program and review it with you. Once we agree on goals we then put the program into play and update you as we complete sessions and provide written commands and progress tracking. Sometimes you need a trainer on site to work through in-home behavioral issues. We provide that service as well. An in-home consultation makes it easier to diagnose specific challenges with destructive behaviors, inappropriate greetings, setting boundaries, etc. Talk to us about what your needs are and we can schedule an in-home consultation at your convenience and on your schedule. Both Mike Young and Diann Young (the owners) are members of The Association of Professional Dog Trainers. In addition to private training that Mike has done for several years, he’s been very active with the Humane Society since 2017. Please contact us or call 405-345-7268 to discuss ways that we can improve your relationship with your dog.